Welcome to our complete guide to sensitive stomach cat food. Looking at the best cat food for cats with sensitive stomaches. Cat foods are formulated to address a variety of ailments, including hairballs, itchy skin and stomach sensitivity. 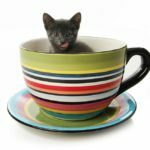 With hundreds of brands and thousands of products available today, it’s hard for the conscientious cat owner to choose the best cat food. In this article we’ll review some of the causes of sensitive stomach. And discover the most favorable ingredients and best foods for cats with sensitive stomachs. Cats show signs of stomach sensitivity by refusing to eat, frequently vomiting, having bouts of diarrhea or constipation, and acting listless. You can often correct these symptoms with a change in diet. 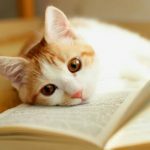 To choose the best food for cats with sensitive stomachs, you should first understand the reason your cat is showing those signs. Veterinarians differentiate regurgitation from vomiting. Regurgitation is your cat’s way of ridding his body of undigested food and fluids. Regurgitation originates in the esophagus so the resulting mass tends to have a cylindrical shape. Occasional regurgitation (once or twice a month) is generally not an indicator of sickness. By contrast, vomit originates in the stomach and upper small intestine and is forcefully ejected from the body followed by drooling and retching. Frequent vomiting can be an indicator of food sensitivity, sickness or disease. Warning: If blood is present in anything your cat expels contact your veterinarian immediately. Diagnostic tests to determine if your sensitive stomach cat has a condition such as chronic small bowel disease or inflammatory bowel disease are costly. These may include biopsies, lab work and overnight stays at the veterinarian. Your veterinarian can also test for food sensitivity and allergies. These may manifest as skin irritation as well as stomach upset. Some foods are formulated to simultaneously treat skin irritation and stomach upset. In cases of food sensitivity and allergies, you can often remove the offending food or ingredient to solve the problem. Fish, beef, milk, and chicken are the most commonly identified allergens in cats. Then again, sometimes an upset stomach is just an upset stomach. The lower cost alternative to medical intervention is changing your cat’s diet. Unless you’re seeing serious warning signs, introducing sensitive stomach cat food is a recommended course of action. 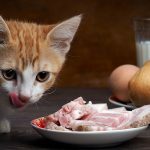 What is the best cat food for sensitive stomach? Well, the real question is what is the best cat food for your cat. 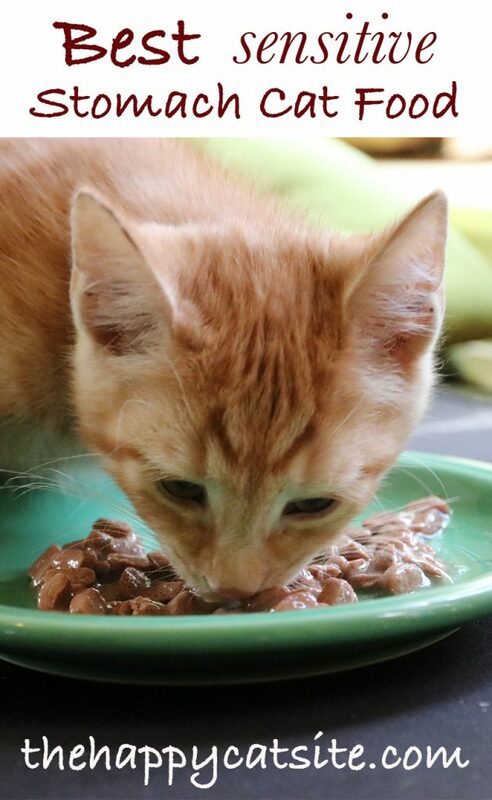 Let’s consider a 6-week food trial with a sensitive stomach cat food. Over these six weeks, take note of how much you are feeding, how much your cat is eating and how he reacts after each feeding. Warning: If kitty is still showing signs of sickness after four days, consult your veterinarian. Sensitive stomach cat foods contain all the required nutrients for your cat and are intended for lifelong use. Once you find a formula that works you can continue feeding that diet – it’s not just for when kitty’s stomach is upset. Some cats eat only dry food, some only wet food, some both. Whichever system you use, stick to it while you try sensitive stomach cat foods. Eating dry cat food promotes dental health and teeth strengthening benefits in your cat. The best sensitive stomach dry cat foods contain single source proteins, specifically, veal, venison, lamb or turkey. This is one key to making food more easily digestible. If your cat has a grain sensitivity, grain free formulas are desirable. Rice and oatmeal are popular fillers appropriate to sensitive stomach cats. For all around health, look for foods with natural ingredients, amino acids, antioxidants and Omega fatty acids, and stay away from artificial colors, flavors and preservatives. Wet cat food should contain the same easily digestible and stomach soothing ingredients as dry food. Because of the high water content, wet food can aid by providing added hydration helpful to cats with diarrhea and constipation complaints. Let’s look at some top brands and formulas in dry and wet foods. These contain ingredients specific to aiding cat’s digestion and all the necessary vitamins and minerals for a complete diet. Hill’s Science Diet line of dry foods are the most highly rated by consumers for their commitment to using high-quality ingredients and producing the desired effect of easy digestion. 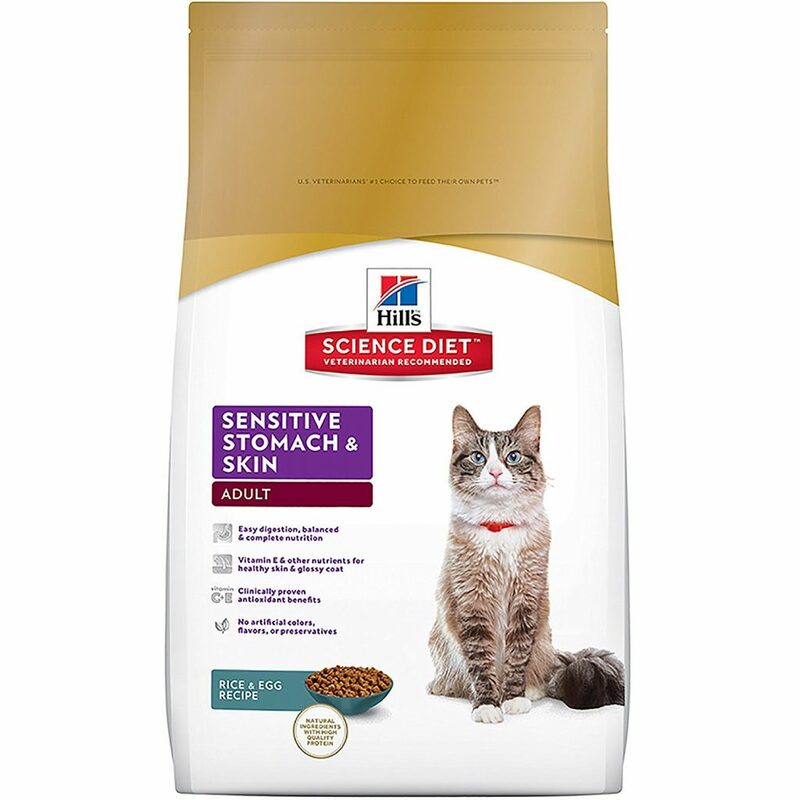 Hill’s Science Diet Sensitive Stomach and Skin Dry Cat Food – Rice & Egg Recipe is formulated to provide complete nutritional value, including vitamins, minerals, amino acids and antioxidants. This food has no artificial colors, flavors, or preservatives. It is appropriate for cats beginning at one year of age; not recommended for kittens. You can buy Science Diet Dry Sensitive Stomach Cat Food here. 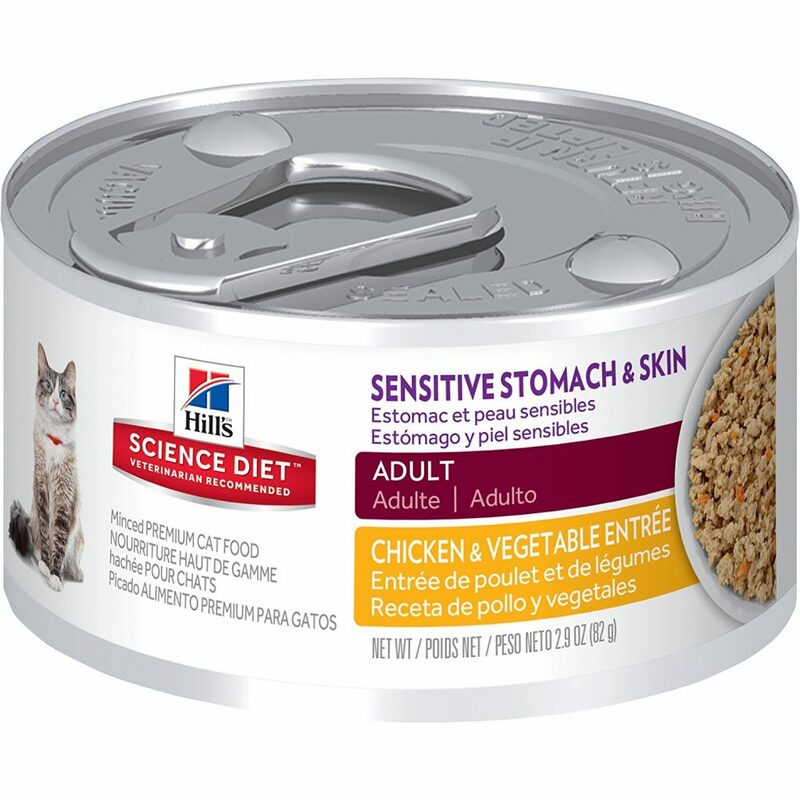 Hill’s Science Diet Sensitive Stomach & Skin Canned Cat Food comes in a chicken & vegetable or tuna & vegetable variety. Both varieties contain multiple proteins (chicken, turkey and/or tuna) which makes selecting for a specific food allergen difficult. You can buy Science Diet Wet Sensitive Stomach Cat Food here. Blue Buffalo offers healthy stomach formulas including “LifeSource bits” which are a blend of antioxidants, vitamins and minerals. Their foods also include a variety of antioxidant-rich fruits and vegetables. 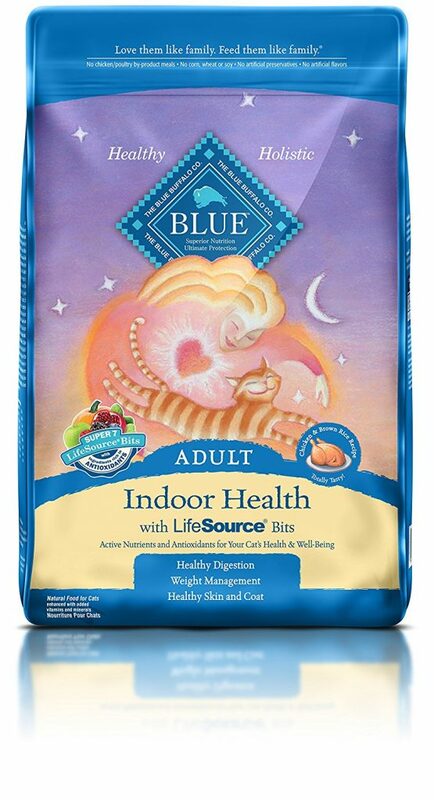 Blue Buffalo Life Protection Dry Adult Cat Food is a highly-rated formula made with real chicken (not poultry by-products) and grains such as brown rice, oatmeal and barley. It is designated for cats with sensitive stomach. Note, this food contains fish oil so if your cat has a fish sensitivity, this might not be a good choice. You can buy Blue Buffalo Life Protection Dry Adult Cat Food here. Alternatively, Blue Buffalo Basics Limited-Ingredient Dry Cat Food is a turkey-based grain-free food which contains pumpkin as an additional digestive aid. This is a favorable combination of ingredients because some cats do have grain allergies and because turkey is not considered among the highly allergenic protein sources for cats. You can buy Blue Buffalo Dry Sensitive Stomach Cat Food here. 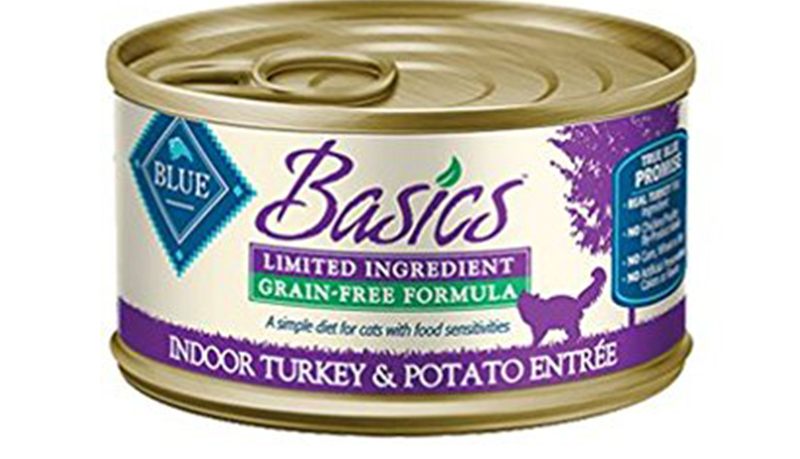 Blue Buffalo Basics Grain-Free Indoor Turkey & Potato Entree For Adult Cats has all the best ingredients and formulation in wet cat food. While eliminating and minimizing ingredients that cause sensitivities (multi-proteins, grains), this complete food maximizes nutritional value for your sensitive stomach cat. You can buy Blue Buffalo Wet Sensitive Stomach Cat Food here. Purina offers three lines of cat food each with a formula for digestive health. These are available almost anywhere cat food is sold – including Amazon.com. This company produces popular and well-rated foods but note they contain a variety of protein sources and less of the “all natural” ingredients found in other (more expensive) brands. The Purina ONE Sensitive Systems Adult Premium Cat Food is a turkey protein based food with antioxidants and omega fatty acids to provide a complete sensitive stomach recipe. The ONE line of foods boasts protein as the first ingredient and no added artificial flavors or preservatives. Purina Cat Chow Dry Cat Food, Gentle is a turkey meal based cat food designed for adult cats with stomach sensitivity. This is a low cost, well rated sensitive stomach cat food. 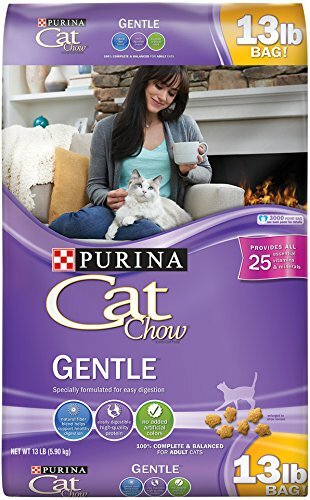 You can buy Purina Cat Chow Dry Cat Food here. 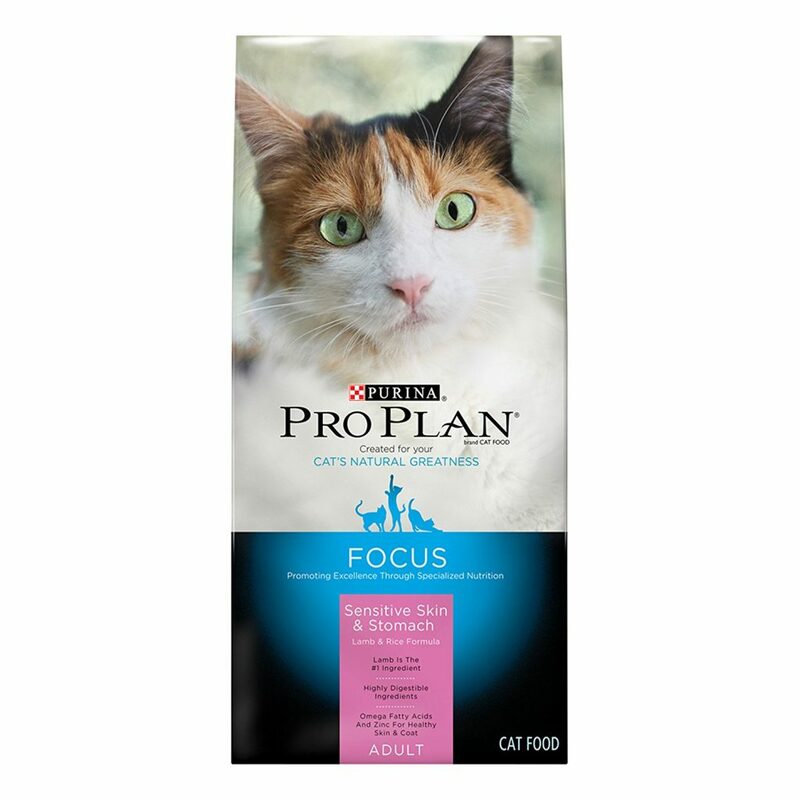 Purina Pro Plan Dry Cat Food, Focus, Adult Sensitive Skin and Stomach Lamb and Rice Formula contains lamb as the number one ingredient but also contains egg and other “animal” products. You can buy Purina Pro Plan Dry Cat Food here. 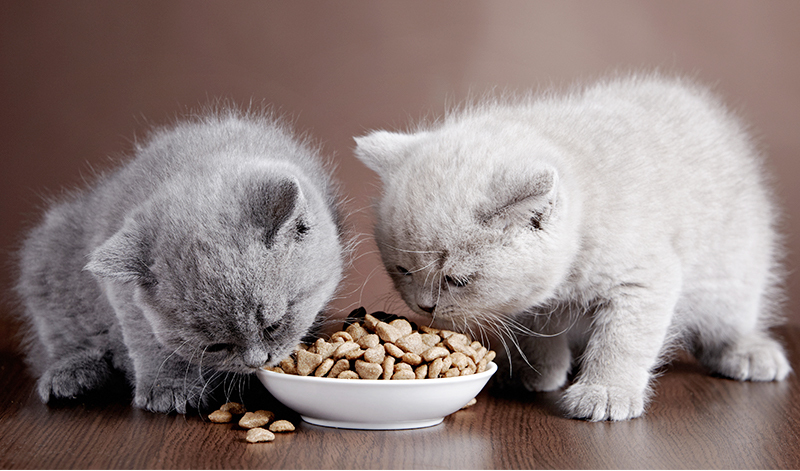 Royal Canin produces the “Veterinary Exclusive” line of sensitive stomach cat foods. These may be prescribed by your veterinarian or you can purchase them through Amazon.com. Expect to pay top dollar for these well-rated foods! 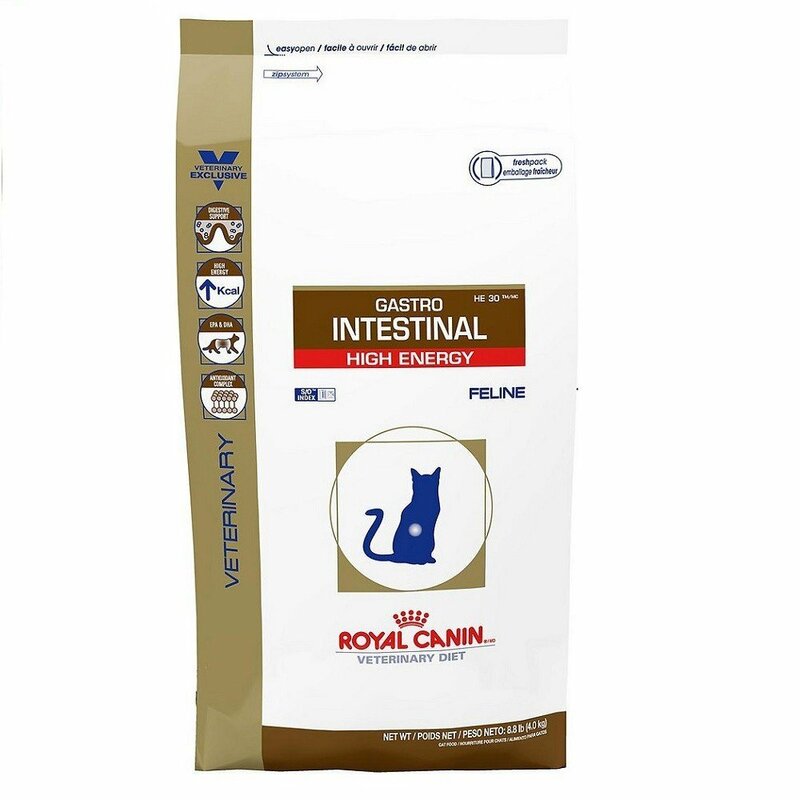 Royal Canin Veterinary Diet Feline Gastrointestinal High Energy Dry Cat Food is indicated to aid in digestion for cats with gastrointestinal disease. You can buy Royal Canin Veterinary Diet Feline Gastrointestinal High Energy Dry Cat Food here. 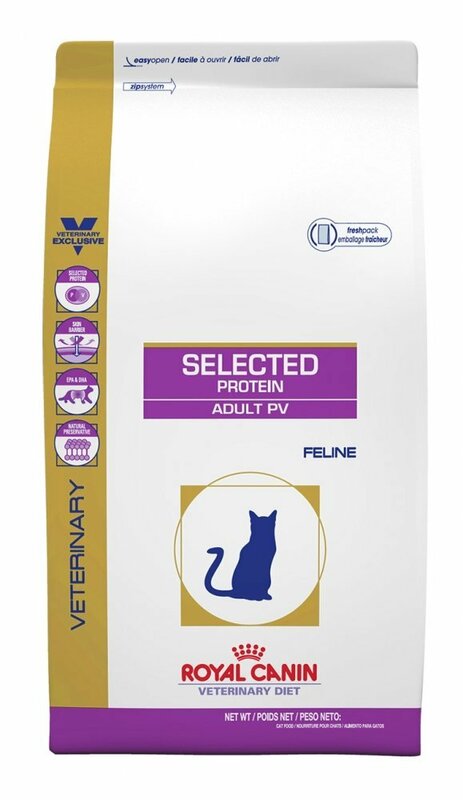 Royal Canin Veterinary Diet Hypoallergenic Selected Protein Adult Pea & Venison Dry Cat Food provides a protein source other than from fish, beef and chicken, which, as noted, are often associated with food allergies. 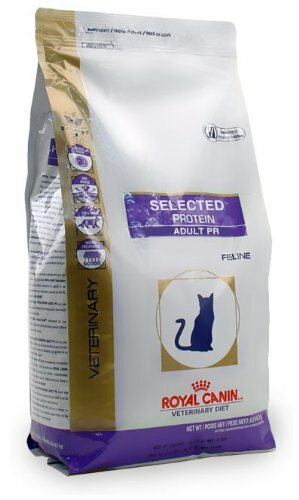 You can buy Royal Canin Veterinary Diet Hypoallergenic Selected Protein here. A lower cost option is the Royal Canin Feline Health Nutrition Sensitive Digestion cat food. This contains easily digestible proteins, complete vitamins and minerals and healthy flora to aid digestion. It is indicated for cats (2 lbs. or larger) with regular stomach upset. 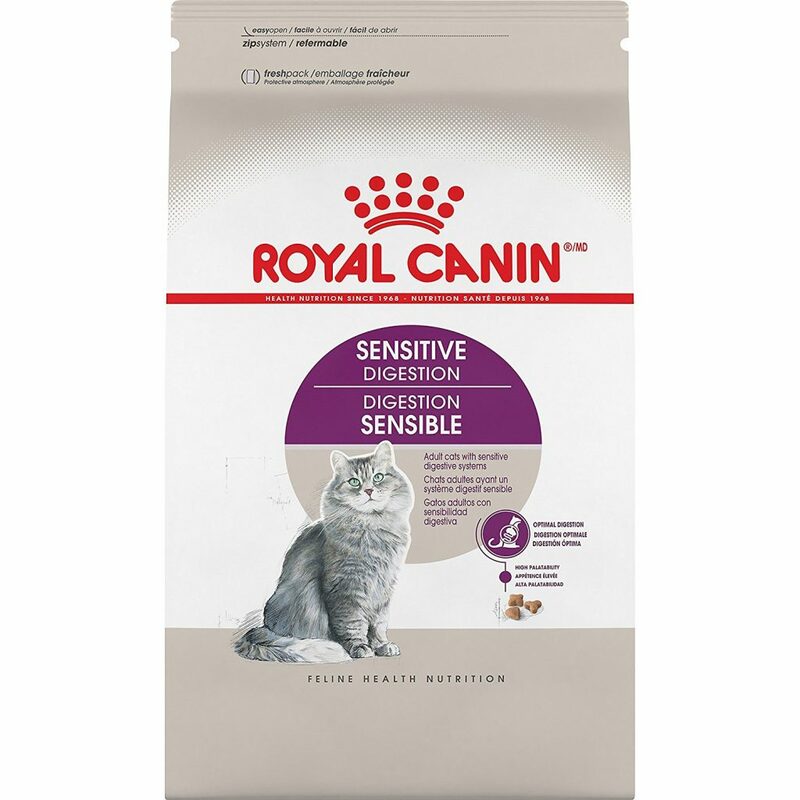 You can buy Royal Canin Feline Health Nutrition Sensitive Digestion here. 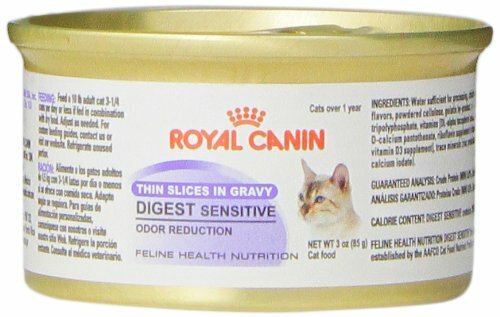 Royal Canin Feline Health Nutrition Digest Sensitive Thin Slice In Gravy is formulated to be easily digestible and decrease the odor of cat’s stools. This is a nutritionally balanced choice appropriate for adult cats. You can buy Royal Canin Feline Health Nutrition Digest Sensitive here. Royal Canin also produces the Hypoallergenic Selected Protein line of foods with varieties such as Rabbit & Pea and Potato & Venison. You might consider these (in dry food, too) if your cat cannot tolerate any of the other less exotic proteins (chicken, fish, etc.). You can buy Hypoallergenic Selected Protein here. While there are specific foods for seniors (which we can explore in another article), all the foods we’ve reviewed here are appropriate for lifelong feeding. Once you’ve identified a sensitive cat food that works for your adult cat, you can feed that food throughout his life. However, if your senior cat develops a problem with stomach sensitivity, you may want to limit the amount of food testing and go straight to the veterinarian. Cats in their older years (11 years+) are prone to additional ailments and even a gradual change in diet without supervision might be hard on them. Food for cats with sensitive stomachs should be introduced gradually over a week long period. Use this schedule: The first two days, make the sensitive cat food 25% of his feeding; the next two days make it 50%, the fifth and sixth day, 75%, and completely switch over to the new food on the seventh day and going forward. Feed no more than the recommended amount for your cat’s age and weight. Do not feed treats such as table scraps, milk or store bought cat treats during this trial period. Once you’ve maintained a healthy response to the new diet for six weeks, you can slowly introduce treats. If you are trying a diet to eliminate a suspected food allergen, make sure to read all the ingredients. Even “single-source” protein foods may contain other proteins as oils or by-products. Do not allow your cat to eat wet food left out for more than one hour. Provide fresh water daily and monitor water intake. If you have more than one cat, but only one is having stomach problems, it’s okay to switch all cats to the new food. 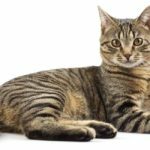 These are complete formulas that can be fed to cats with stable or upset bellies. Certain breeds such as Siamese are susceptible to bowel problems. If your Siamese is experiencing stomach problems, seek veterinary care. 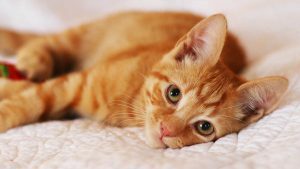 While there are many underlying causes of sensitive stomachs in cats, resolving the problem by changing his diet to a sensitive stomach cat food is a good first step and a responsible alternative to medical intervention. Review all the indicators and ingredients on a cat food to match the best product to your cat’s sensitive stomach needs. Consult a veterinarian when a change in diet is not getting results. Finding the best cat food for sensitive stomachs takes some trial and error. Be patient and monitor your cat closely to promote a long life with your happy cat. I have a senior cat with IBS, but also has kidney issues. He’s been given kidney diet which he hates, but seems to respond to sensitive stomach dry and wet foods. Do these foods contain higher levels of proteins which could further harm his kidneys? Do you have any suggestions for a food that might work best for him? Thank you. I had a cat in end stage renal failure whom I fed the prescription kidney diet. He lived an additional 3 years! I attribute that to the prescription diet in large part. As I recall he didn’t like the canned version but did eat the dry kidney food. I worked closely with my vet who was SO helpful with suggestions to every incident we experienced. I suggest you do so too. Not all vets are created equally though. If your vet is not one to work with you on the proper diet for your cat, find a vet who can, maybe one who specializes in cats. Best of luck to you! You have not mentioned Halo brand, is there a reason for this?